Handling all your waste and recycling needs. Rear-load trucks are most common in residential areas, but can also be very effective for commercial and industrial applications. With Ontario Waste’s rear-load truck service in Halton and Peel, there’s no need to have a bin on your property — saving you space and keeping you in compliance with local bylaws that may have banned bins due to noise and aesthetic concerns. Our rear-load service is ideal for retail plazas and other commercial properties that don’t have a designated space for waste bins. The Ontario Waste team will manually remove waste from your building and load it into one of our rear-load trucks. Garbage rooms are also well-suited for our rear-load service. Our trucks can easily accommodate waste from these rooms as little to no equipment is required for its disposal. As an alternative to bins, 95-gallon totes can be used to store waste and streamline the removal of waste and recyclables. These totes can be moved around easily and keep rodents away, and are picked up by our rear-load waste and recycling trucks. With no bins to worry about, our rear-load packer service makes on-call and one-time pickups easy. Give us a call at 905-338-1576 to arrange for a pickup. 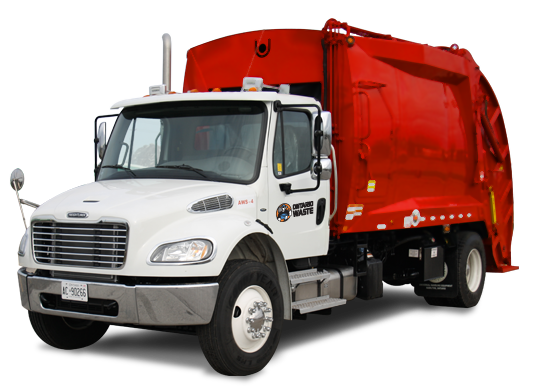 Our Mission at Ontario Waste is to meet and exceed your waste management expectations! We are here to help you with all of your waste management needs. Working with Ontario Waste means you will receive the very best service in the industry.